Looking to get a great potato ricer for your kitchen? The OXO Good Grips Stainless Steel Potato Ricer is a best-seller on Amazon, and for good reason. Read on to learn a bit more about this device, including some of its key features, specs, and some pros and cons according to past users. Hopefully, this all gives you a good overview of the product, and you can determine if you’d see yourself using this potato ricer in your kitchen! This little kitchen tool packs a punch. By placing the ricer above any bowl, inserting most vegetables into the container/sieve, and using manual leverage to press them down through the sieve, you can use this to create perfectly textured dishes like mashed potatoes, baby food, and more! It ensures even, fluffy textures every time, and comes with some unique features that really make it stand out from other potato ricers. What really sets the OXO apart and ahead of most other ricers is its extra knob that acts as a no-slip feature. Instead of holding and balancing the ricer over your catcher bowl, you can simply place the ricer on each end of the bowl and use it that way. Its coated with a black silicone material, so you can be sure that it won’t slip into the bowl. 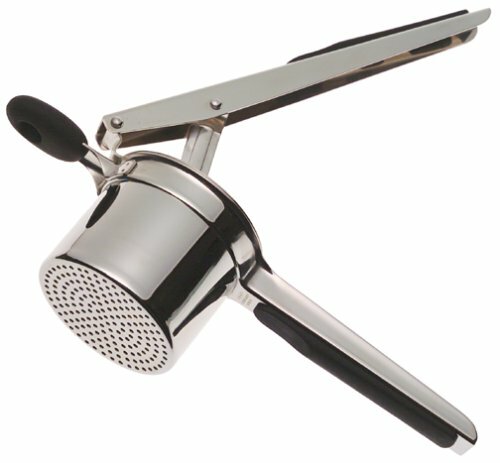 Another unique feature, that OXO boasts in all of its products (hence its name, “OXO Good Grips”), is this potato ricer’s soft grip handles. The handles of this device are coated with the same black secure comfort material of the knob, making it easy to operate and comfortable to handle for people of any age. Ricers without these features, especially those made out of stainless steel, can be very uncomfortable to operate, especially if you’re older and have weaker hands. However, there are some major advantages of the stainless steel build of this product. Stainless steel is one of the most durable materials on the market, and it’s FDA approved to be food safe. This means it’ll give you years of consistent performance, and it’s a great long term investment for your kitchen. To give you a better sense of what you’ll get with this purchase, here are some specifics on the product itself. Its dimensions are 11.9 by 3.5 by 4 inches, which makes it pretty much handheld for the typical user. It weighs just over 7 ounces as well. This potato ricer also has a sleek silver color from the stainless steel, and the silicone handles are black, so it will match any kitchen decor and style. Reviews by users online are overwhelmingly positive. There are 769 reviews, averaging 4.5 stars. Owners of the OXO Good Grips Stainless Steel Potato Ricer say it gives them impeccably smooth, creamy, fluffy texture without compromising on flavor for dishes like mashed potatoes, gnocchi, and more. Because it takes a decent amount of pressure to push the vegetable through the product, people really love the comfort handle feature. They also like how compact this device is, and its versatility as well. Aside from the typical dishes, you make with a potato ricer, users have found that you can use this product to dry out leafy vegetables like spinach as well. It acts as a sort of hand-held strainer, making it a great 2-in-1 kitchen tool. However, those 4-star reviewers have some reservations. The primary complaint about this potato ricer has to do with its limited disc size selection. Many potato ricers come with multiple discs that are easily interchangeable so that you can easily choose and control the grain size of the riced produce. The OXO ricer doesn’t have this interchangeable feature, and you’re “stuck” with the size they provide. While it doesn’t matter much if you’re just going to mash up the grains anyway, people still like the various choices that come with other models. Some other users found the vegetables very hard to push through the sieve, despite the comfort handles. OXO suggests boiling or cooking the food you’re going to push through until tender to avoid this issue. Some also wish the device was a bit larger for bigger batches of food, but for the typical family or home chef, this size works just fine. If you’re looking for a high-quality potato ricer to help you make the creamiest, fluffiest dishes ever, you should definitely take a look at the OXO Good Grips Stainless Steel Potato Ricer. It has rave reviews by past users, some very unique and handy features, and is moderately priced to fit most budgets. While it doesn’t necessarily give you the versatility of similar potato ricers that come with multiple sized sieve discs, the one it comes with is sufficient for most dishes. Have you used this potato ricer? What are your thoughts? Share below!